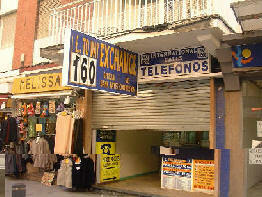 These ‘shops’ are situated all over Benidorm, once you have ended a transaction there is nothing you can do. The police can do nothing. There Are Other Exchange Shops That Will Scam You. Watch out for the gangs known as ‘The Pea Men’ they operate around the main streets and beach area with a cardboard box set up as a table and three shells or potatoes, and using a very cleaver slight of hand they will have your money. They also have pick pockets in the crowd. The gang can have has many as 20 in them, police lookouts on corners etc, and other members pretending to be playing the game to rope you in. Just avoid them, don’t even stop to look. Please remember the Golden Rule. If something seems too good to be true.... It usually is!!! 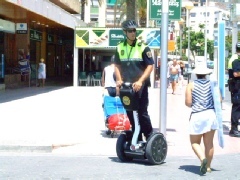 The one thing that you will notice in Benidorm is the high police presence, walk along the Levante promenade and you will see a policeman or two every few minutes, walking, on the new wheelie things, in police cars and motor cycles. They are everywhere. It’s the same at night every few minutes you will see a cop. 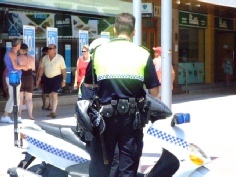 I must say I walk around Benidorm in the early hours of the morning, obviously keeping to well lit main streets with plenty of other people around and I feel reasonably safe. This is something I would never do in my home town of Grimsby or neighbouring Cleethorpes. 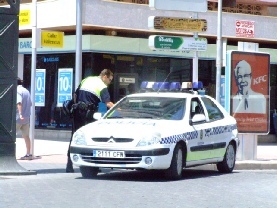 You can go a week and never see a cop, unless there is a football match when they get extra money. Ladies.. Watch your hand bags!!!! If your not watching your bag it will be gone so fast you will wonder what happened. Don’t take valuables out with you leave them in the hotel safe. Only carry enough cash for the day/night.